I apologise for being late again this issue; there’s really nobody to blame but myself. I lost about a week’s work due to being in a blue funk over two pieces of news that came to me while working on the issue. The first was the news of Loren Wiseman’s death; I’ve written a short obituary that appears on page 63 of this issue, and… well, you see the cover. The other… I’m starting on a never-ending, life-changing journey, and not for happy reasons. At my physical this year, the usual lab work was done, but the results weren’t usual. I have joined the ranks of those who live with Type II diabetes. That doesn’t mean I’m planning on closing down Freelance Traveller; I’m not letting diabetes take away my contribution to the Traveller community. I can’t grumble at the fact that I’m not seeing a flood of submissions to match the flood of commercial releases I’ve been seeing on DTRPG; I’ve said all along that if you think you can make money off your work, by all means do so. But I’d still like to see more stuff come my way…. 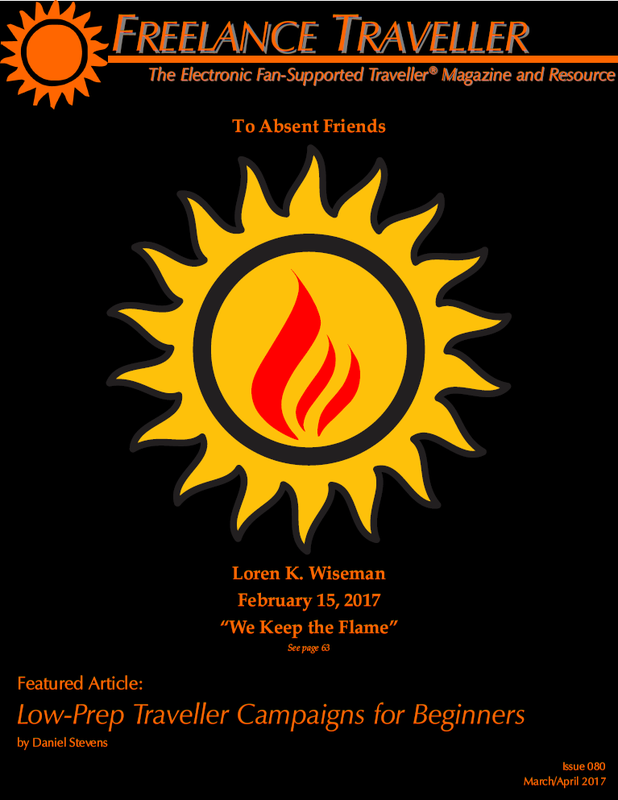 While we were working on preparing this issue of Freelance Traveller for you, we received some sad news: Loren K. Wiseman, one of the founders of Our Game, passed away on February 15, 2017. Loren had been involved in Traveller from its very beginnings, as one of the creators of Classic Traveller for GDW. After a stint of unemployment following GDW’s closure, he joined Steve Jackson Games, where he was the line editor for GURPS Traveller. He was an occasional visitor to several on-line Traveller forums, including the Traveller Mailing List, until his health started failing him. He was undoubtedly one of Traveller’s larger-than-life figures, and he will be missed.